[00:28] - Kasey welcomes listeners to today’s episode and explains what it will be all about. 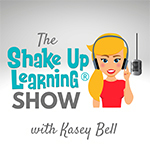 [02:11] - Before we dive into this episode, Kasey gives a shout out to the Shake Up Learning podcast launch team! [03:38] - Jasmine introduces herself and talks about the students and parent involvement at her school. [08:58] - We hear about what Jasmine’s class looks like on a day-to-day basis, specifically in terms of technology. [16:54] - Kasey shares her response to all of the awesome things that Jasmine is doing in her classroom. [17:44] - Does Jasmine have any videos of the projects she’s been talking about? [18:35] - Jasmine explains why she wants Kasey’s help. [20:14] - Kasey starts off her coaching by asking Jasmine some questions specifically about the water cycle lessons. [21:48] - On a scale of 1-10, how would Jasmine rank her water cycle lesson? [26:05] - How much time did Jasmine originally plan for this lesson? [27:44] - We hear about what would have made Jasmine’s lesson a 10 instead of a 9. [30:50] - Kasey points out the importance of having an end goal in mind. [32:31] - Jasmine talks about the 3D printer project that she’s working on right now. [34:50] - Kasey takes a step back and offers Jasmine a piece of advice: always start with the learning goal! [37:03] - Was there a learning goal that Kasey had in mind with all of this? [41:38] - We hear Kasey’s advice on adding in tech only when it will lead directly to learning goals. [43:25] - Jasmine replies to Kasey’s advice and talks about where her thoughts are now and what she is realizing from this conversation. [45:48] - Kasey makes a suggestion for Jasmine. [47:31] - What Kasey has been saying is related to the fail-forward concept, Jasmine points out. [48:29] - We learn more about Genius Hour and how it works. [51:40] - What are Jasmine’s next steps, and what does she think she’ll work on next? [54:51] - Here’s this week’s podcast question: have you ever tried to integrate too much at once, like Jasmine? How do you ensure that your enthusiasm doesn’t distract from the purpose of the lesson? Share your answers on your favorite social media platform using the #shakeuplearning hashtag, or post it in the Shake Up Learning Community on Facebook! But don't miss this opportunity! These courses only open twice a year.